Benjamin Burridge Swaffield was born in Clifton Maybank, Dorset, (just southeast of Yeovil) in 1865 and baptised on 25 December 1865 at Bradford Abbas. His parents were dairyman George Swaffield (1819-1889) and Jane née Burridge (b1830). However, to confuse his early years there was a Benjamin James Swaffield born around the same time in Clifton Maybank. Benjamin was listed in the 1881 census as a 15-year old lodger at 4 Peter Street where he gave his occupation as "Apprentice to Piano Manufacturer". His father died in 1889, aged 70. In the 1891 census Benjamin was listed living in Earle Street with his widowed mother Jane, older sister Annie Jane and grandmother Sarah (sic) Burridge, together with a couple of boarders, including 23-year old Harry C Foote. Both Benjamin and Harry gave their occupations as "Pianoforte Tuner & Repairer". In the spring of 1894 Benjamin married Ellen Rouse (1860-1939) at Yeovil. Ellen, from Battersea, London, was the daughter of William Robert Rouse (1825-1911) and Mary née Benwell (b1821). They were to have two sons; Victor Norman (b1898) and Cyril Frank (b1902). In Whitby's Yeovil Almanack Advertiser of 1898 Benjamin was listed as "Benjamin Swaffield, Piano Tuner of 52 The Avenue". In the 1901 census Benjamin, Ellen and Victor were listed at 52 The Avenue and once again Benjamin gave his occupation as "Pianoforte Tuner & Repairer". 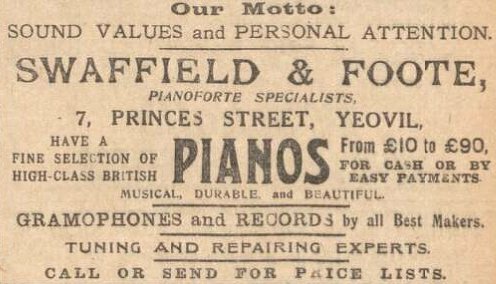 In 1907 Collins' Yeovil Directory listed Benjamin twice; as "BB Swaffield, Piano Dealer & Tuner of 6 Wyndham Street" and also as "BB Swaffield, Music Teacher, 6 Wyndham Street". By 1911 Benjamin, Ellen and their two sons were living above the shop premises "Elgar House", 24a High Street and Benjamin listed his occupation in the census as a "Musical Instrument Dealer". Although they had known each other since at least 1891 it was around this time that Harry Foote returned to Yeovil. Certainly by 1912 Benjamin went into partnership with Harry Foote to form "Swaffield & Foote". Ellen died in Yeovil in the autumn of 1931, aged 72, and Benjamin died in the spring of 1938, aged 72. Henry Charles Foote, known as Harry, was born on 9 March 1868 at Devizes, Wiltshire. He was the eldest of the five children of carpenter and wheelwright Henry Foote (1841-1918) and Eliza née Wilcher (1836-1901). In the 1871 census Henry and Eliza, together with three-year old Harry and his younger brother Herbert, were living at 1 Lansdowne Terrace, Devizes. The family were still at this address in 1881 but the family had now increased with the addition of three more children; Arthur, Annie and Fanny. By the time of the 1891 census 23-year old Harry C Foote was lodging with Benjamin Swaffield in Earle Street. Both Benjamin and Harry gave their occupations as "Pianoforte Tuner & Repairer". On 27 December 1898, at Lyme Regis, Dorset, Harry married Kate Ellen Bondy (1871-1951). Harry and Kate moved to Bexhill on Sea, Sussex. They were to have three children; Dorothy Kate (1900-1986), Leonard Jack (b1901) and Bernard (b1905), all born at Bexhill. In the 1901 census Harry (listing his name as Henry) and Kate, together with baby Dorothy, were living at 69 Reginald Road, Bexhill, Sussex. Harry gave his occupation as a Pianoforte Tuner. By 1911 Harry moved his family back to Yeovil and the census listed him and Kate, together with the three children at 2 Colmer Road. Certainly by 1912 Harry went into partnership with Benjamin Swaffield to form "Swaffield & Foote". Harry Foote died in Yeovil in the autumn of 1947, aged 79. Kate died in Yeovil in the spring of 1951, aged 80. They had known each other since 1891 when Benjamin Swaffield had Harry Foote as his lodger in Earle Street. 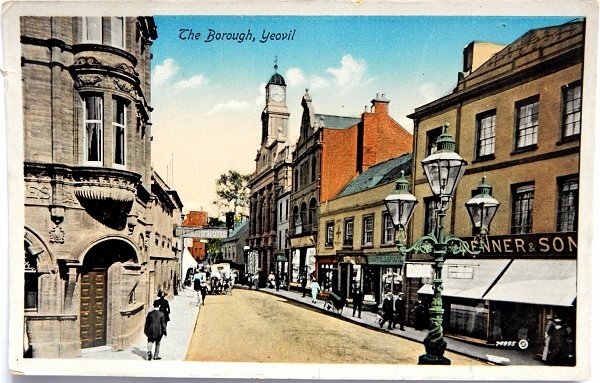 Harry then moved away but had returned to Yeovil by 1911 - whether or not by Benjamin's invitation is not known. 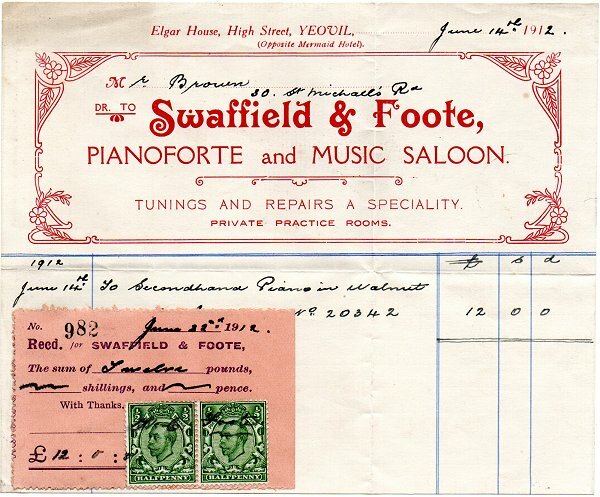 However, certainly by 1912, they had become partners in Swaffield & Foote at the Pianoforte and Music Saloon at Elgar House, 24a High Street (opposite the Mermaid Hotel). 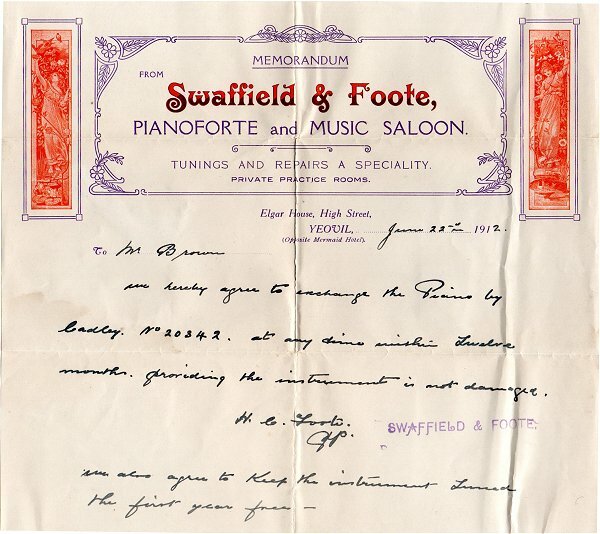 Swaffield & Foote were frequently thanked in the press for lending pianos for charity functions, such as a concert in aid of Somerset Wounded and Prisoners as reported in the Western Gazette in December 1916. They also acted as booking agents for various ticket functions and performances into the 1930s from their "Music Saloon". Kelly's Directory of 1919 listed them as "Swaffield & Foote, Pianoforte Warehouse, 24a High Street" but in 1920 the business moved to 5 Princes Street. 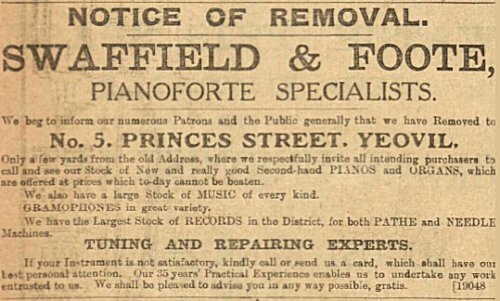 Perhaps piano sales were down or the business simply branched out, but it was listed in Kelly's Directory of 1935 as "Swaffield & Foote, Music & Musical Instrument Dealers of 7 Princes Street". Had they really moved all those pianos from 5 Princes Street next door to 7 Princes Street? Was this a typo? or was Princes Street re-numbered? After the death of Harry Foote in 1947, Swaffield & Foote was run by BG Gillett at Everton Road. The final trade directory listing was in Edwin Snell's Directory of 1954, the listing read "Swaffield & Foote, Piano Dealers & Tuners of 5 Everton Road". High Street photographed in 1897 by Jarratt Beckett. The Fleur-de-Lys photographed in 1898. 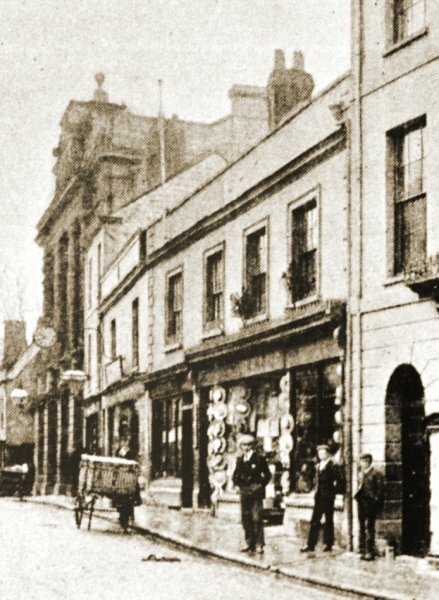 The three-storey building at extreme right with the arch is the shop of Linsey Denner. The Fleur-de-Lys is the left-hand half of the two storey building with the cart outside. The shop at centre, with all the hats hanging up, would become the premises of Swaffield & Foote, called Elgar House. A hand-coloured postcard of just before the Great War as the Town Hall now has its new clock, erected in 1912. Swaffield & Foote shared their two-storey premises with the Fleur de Lys pub. 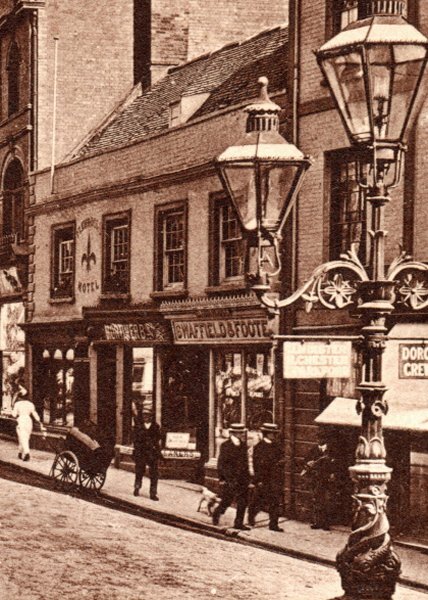 An enlargement from a sepia-toned version of the previous postcard showing that since the 1897 Jarratt Beckett photograph above, Swaffield & Foote occupied half of the premises and that a small shop had been formed between their premises and the Fleur de Lys Hotel. 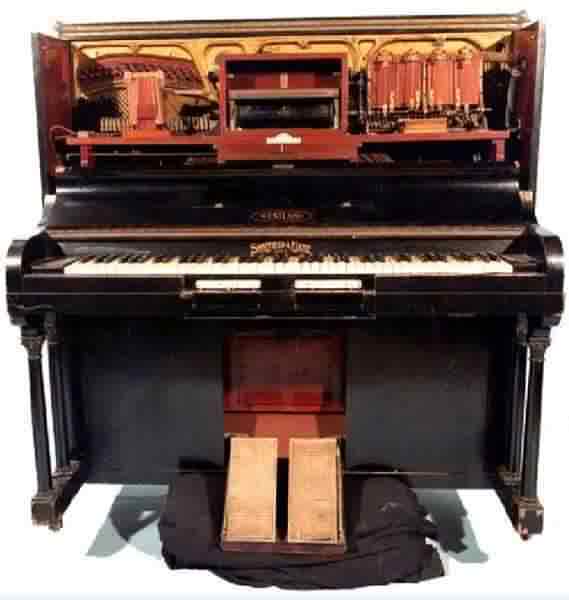 The 'Westland' pianola, by Swaffield & Foote. A receipt dated 14 January 1912 for a second hand piano for just £12 (although actually that's over £1,000 at today's value). Clearly Mr Brown wasn't completely happy with his £12 piano!! In 1920 Swaffield & Foote moved premises from the High Street to 5 Princes Street. This "Notice of Removal" was placed in the 11 June 1920 edition of the Western Gazette. 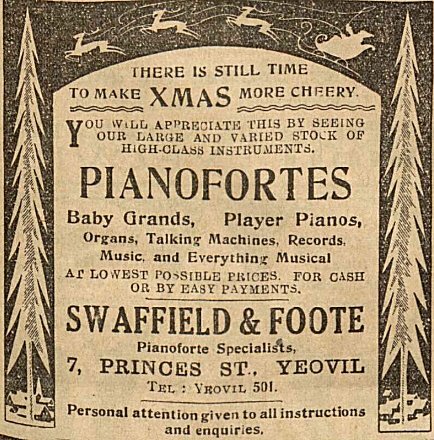 Swaffield & Foote's advertisement in the 24 December 1926 edition of the Western Gazette. 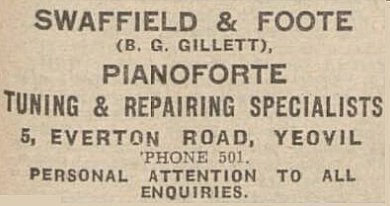 Swaffield & Foote's advertisement in the 15 November 1929 edition of the Western Gazette. Had they really moved all those pianos next door to 7 Princes Street? Was this a typo? or was Princes Street re-numbered? Who knows (and, let's face it, who cares?). 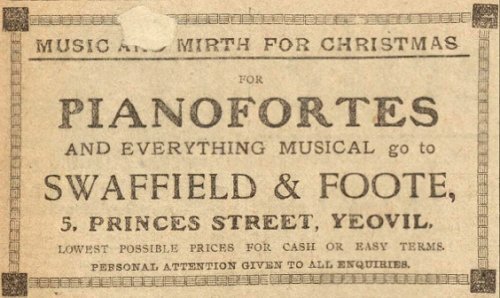 .... and an advertisement for a cheery Christmas - providing you bought from S&F. This advert is from the Western Gazette's edition of 15 December 1933. Following the death of Harry Foote in 1947, Swaffield & Foote was run by BG Gillett at 5 Everton Road. This advertisement was placed in the 3 October 1947 edition of the Western Gazette. Note that Mr Gillett also took over the S&F telephone number of Yeovil 501.